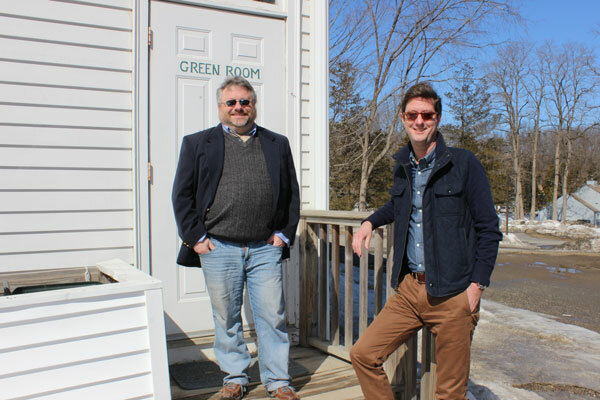 The Sherman Theater President, Robin Frome, and First Selectman Clay Cope standing in front of The Green Room's outside door together. March 6 commemorates the official completion date for the much anticipated round of renovations at The Sherman Playhouse. The timing couldn't be more perfect, especially with The Sherman Playhouse's 2015 season starting up on the opening night of April 10 with the classic onstage sci-fi thriller, "1984". After walking into the newly renovated areas with Robin Frome, President of The Sherman Playhouse and project liaison, it's easy to see why the theater community and many of their local supporters are enthusiastic about all of the latest improvements and additions made to this town-owned property. The playhouse tour with Mr. Frome began by entering the foyer, which was completely rebuilt and remodeled. The "ladies and gents" rooms, last renovated in 1960 / 1961, were the next stops. Not only do they look classy with many dramatic improvements made, but the two bathrooms are now also completely up to code. 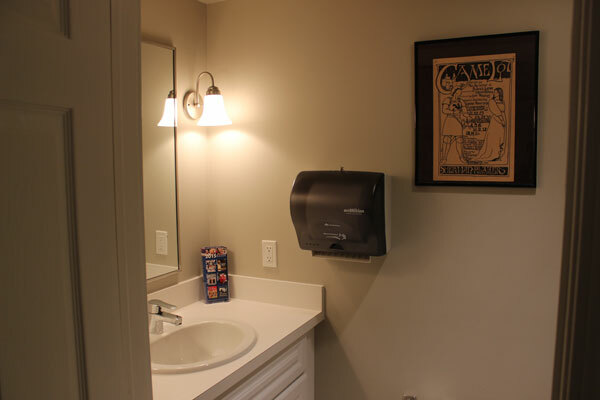 In addition, "Hawley Construction from Danbury took half of the theater office away so the cast could finally have a bathroom of their own, which is a novelty in theaters, and the office also has new walls," Mr. Frome pointed out. A "slop sink" was another new amenity. "This was on the theater's wish list for over 80 years and it will be extremely helpful when painting the sets," he said. Another enhancement was new tile flooring in all of the newly renovated areas. The washer / dryer hookup with a new laundry room, along with a theater storage closet, are also brand new. As for decorating these spaces, this is a work in progress. Mr. Frome shared some of the "history on the walls" of the theater. He is starting to rehang all kinds of theater memorabilia saved over the better part of the century, and it is quite an impressive and extensive collection for theater enthusiasts to appreciate. Mr. Frome was the theater's main go-to person for this renovation because he is also responsible for the theater building. He recalled how "the actual project began last February of 2014. This is when First Selectman Cope got the Small Town Economic Assistance Program (STEAP) Grant. There were a lot of things going on at the time like changing the plans, going back and forth between the State and the Town for compliancy, etc." He said "what's great is that we got the Town of Sherman behind this renovation project. Otherwise, it wouldn't have happened. Clay was very instrumental. Projects like these give me such a good feeling about what the Town will do for us. It's extremely gratifying. For this whole project, we worked well as a team." Al Chiappetta, The Sherman Playhouse's Vice President and Technical Director, was also involved. Mr. Frome said "he made it possible for the plumbing to happen and was the facilitator with the construction company." Mr. Frome shared "we had to get a niche for the construction company we really liked and chose Hawley Construction. When the place was gutted, we worked around it, and the area really looked like the catacombs. The actors were extremely malleable and patient during the renovation. The Town, too, was very accommodating. The opening night party for "It's a Wonderful Life" was in the Town Hall." "The renovation went beyond my expectations; from the tile flooring throughout, down to the smallest details that were included, like the electric towel dispensers. I am amazed that everything came out so well. Hawley Construction was great to work with. Everything was 'of course' and not 'we'll see' with them. They were a pleasure to work with as well." I can't wait to celebrate in style at our opening night party, which we will also celebrate the opening of our new season and our renovations," he said with enthusiasm. First Selectman Cope recalled how he noticed in 2012 the conditions of the building and knew that "Sherman needed to maintain the buildings we own rather than building new projects." This project that he initiated "started out as a code issue because of the plumbing and American Disabilities Act (ADA) non-compliancy, and that's why I thought it needed attention. This project seemed to take forever to get the funding and it was the longest planning project I was ever involved with. 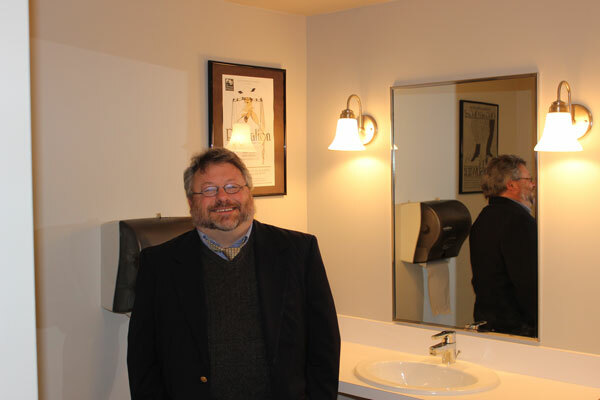 Former Sherman Playhouse President, John Taylor, was also involved in the early stages of this renovation project." First Selectman Cope said "originally, the STEAP Grant awarded was for $69,000. I wrote the grant application with estimates from a local contractor and I fought for the money. When it went to bid, the lowest qualifying bid came in higher at $79,000." "The extra costs for the project added up to a total of $21,000 and it was covered by a previous STEAP Grant from the playhouse windows project that came in under budget. First Selectman Andrea O'Connor should get credit for writing this windows project because she secured the funding. I only supervised the installation of this earlier windows renovation project," he added. Regarding these residual funds, First Selectman Cope said he received permission from the State, the Office of Policy Management who administers grants, to apply the remaining unused funds from the windows project. $10,000 paid for what the new STEAP Grant did not cover and $11,000 paid for the Change Orders for this latest renovation project. When asked "what did the Change Orders include?" He gave examples like replacing the baseboard heaters, changing the door handles, extra tiling for The Green Room floor, and adding a slop sink, which expanded the project scope. When asked "what would you like to see improved for the next phase of theater renovations?" Mr. Frome said "we'd like to see new cushions for the seating and more electrical power capacity for stage lighting. Basically, we will need more power to enhance our capabilities for more technically demanding performances in our future productions." After walking in a mess of mud after "The Great Thaw" from winter, First Selectman Cope shared how he believes the next improvement project for the theater should be to have the theater road paved. "This would replace the existing dirt and gravel road that gets muddy and messy every time it rains or snows. People track in all of this dirt and grime into both the theater and the new Emergency Services Facility (ESF) because the buildings share the road," he said. In a separate dialogue with Betsy Scholze, Treasurer of The Sherman Playhouse and granddaughter of the theater's founders, she said "yes, making the pews more comfortable with new cushions" is top on her list for the next theater improvement. Ms. Scholze is appreciative and added "we all are thrilled that this grant finally came to fruition, a much needed upgrade."